For this 1897 publication, the American philosopher William James (1842-1910) brought together ten essays, some of which were originally talks given to Ivy League societies. Accessible to a broader audience, these non-technical essays illustrate the author's pragmatic approach to belief and morality, arguing for faith and action in spite of uncertainty. James thought his audiences suffered 'paralysis of their native capacity for faith' while awaiting scientific grounds for belief. His response consisted in an attitude of 'radical empiricism', which deals practically rather than ideologically with real-world phenomena. When facing a 'momentous' decision about belief, he says, we both can and must choose the best hypothesis. The first four essays apply this principle to religious faith, and the rest explore the pragmatic approach to such topics as determinism, ethics and individual achievement. 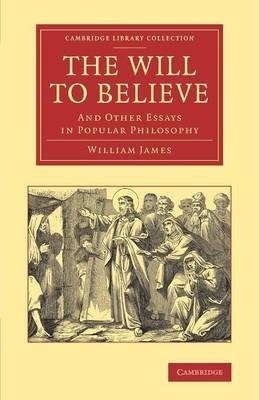 James developed his ideas further in The Varieties of Religious Experience (1902) and Pragmatism (1907), both of which are reissued in this series. Preface; 1. The will to believe; 2. Is life worth living; 3. The sentiment of rationality; 4. Reflex action and theism; 5. The dilemma of determinism; 6. The moral philosopher and the moral life; 7. Great men and their environment; 8. The importance of individuals; 9. On some Hegelisms; 10. What psychical research has accomplished; Index.